A slice of bread just isn’t what it used to be—now it’s much more. In contrast to that piece of white bread with peanut butter that grandma may have served, consider the entries in the recent National Festival of Breads baking contest: Mexican Street Corn Skillet Bread; Orange-Spice Anadama Wreath with Walnuts and Dates; Butternut Romesco Braid; or the winning entry, Seeded Corn and Onion Bubble Loaf. Those examples, and most of the other 300 entries the contest received, are proof that bread is more than just a humble staple on the dinner table. That’s the message sponsors of the Festival of Breads (King Arthur Flour, Red Star Yeast, the Kansas Wheat Commission, John Deere and others) intend to communicate. “Our goal with this biennial event is to bring the best home bakers in the country to Kansas—the wheat state—during harvest to learn how wheat is grown and how flour is produced. And, we hope to also boost the interest in baking among the public,” says Marsha Boswell, communications director for the Wheat Commission. Salina, Kansas, wheat grower Joe Kehr hosted the eight finalists while combines were rolling this past harvest. “They each spent time in a machine to get a better understanding of what’s behind the flour they use. This type of interaction is good for our industry,” says Kehr. 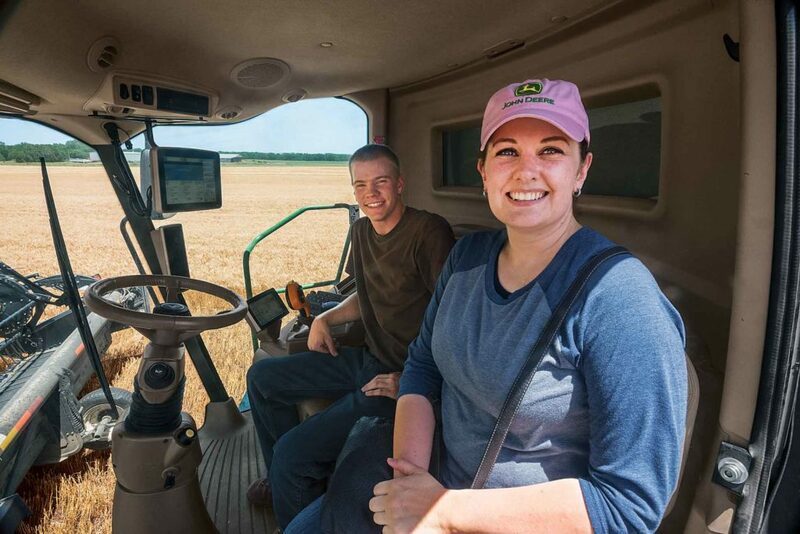 Tiffany Aaron enjoys a combine ride on the Kehr Farm near Salina, Kansas. “This event assists consumers in understanding and appreciating the quality products used in baking bread and the process of bringing food to the table,” says Prescott, Arizona contestant Mary Hawkes. Wheat harvest wasn’t a new experience for Tiffany Aaron, who grew up watching it from a small town in Montana. “My mother taught us to chew wheat to make gum and we milled it ourselves to bake bread.” Aaron, now from Quitman, Arkansas, says baking has become her passion, and she enjoys baking down-home comfort food to share with family and friends. Her entry-—Tumeric-Rosemary & Sweet Potato Rosettes—fits the family mold as her father-in-law grew the sweet potatoes. Shauna Havey looked at what was trendy and popular in bakery products when she developed her Butternut Romesco Braid entry. “I wanted something savory with a tender texture but that was also a decadent over-the-top kind of bread,” says the Roy, Utah, finalist. Kelly White’s anadama bread recipe is based on a braided or wreath bread that was a holiday treat as a child. Columbus, Ohio, finalist Michele Kusma took up baking after a breast cancer diagnosis spurred her to “throw her full effort into something.” To her satisfaction, and her family’s delight, she chose baking. 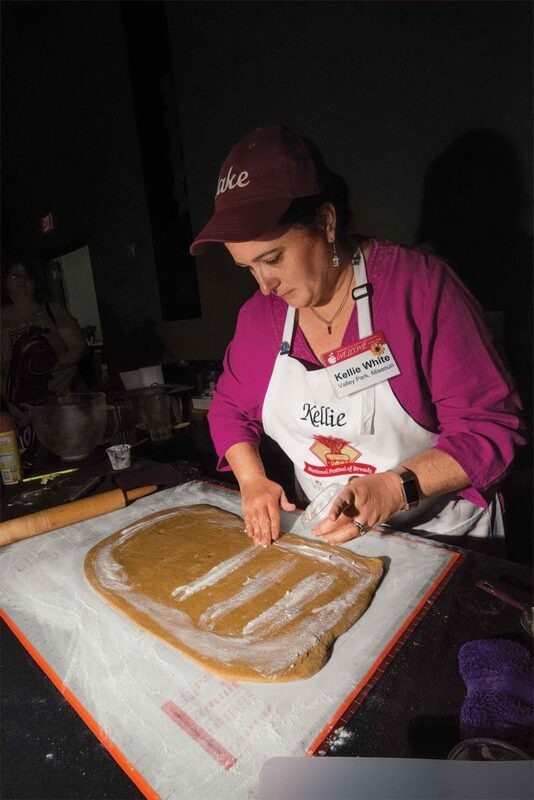 The eight finalists in the National Festival of Breads shared baking ideas with 3,000 people who watched as they prepared their recipes while also listening to educational baking presentations at the day-long contest in Manhattan, Kansas. Ronna Farley of Rockville, Maryland, won the competition—the nation’s only amateur baking contest—with her Seeded Corn and Onion Bubble Loaf. Her winning recipe—and those of the seven other finalists—can be found at nationalfestivalofbreads.com.